In the previous post of the series, Nicola Morris explored the surviving Irish census returns. In this issue, she discusses the main 19th century census substitutes; what the records will tell us, where to find them online and how to best use them for research. I may have already mentioned that almost the entire collection of 19th century census returns for Ireland were destroyed by 1922. Genealogists have spent the last one hundred years finding so called census substitutes: sources that document the population that can be used instead of the destroyed census returns. There are two very important census substitutes for Irish genealogical research, namely Griffith’s Valuation and the Tithe Applotment Books. The most well-known Irish census substitute is Griffith’s Valuation, also known as the Primary Valuation of Ireland. Griffith’s Valuation was a nationwide survey of property undertaken between 1847 and 1864 to value property for the purpose of taxation. The taxation was levied on property for the support of the local Poor Law Union. Nearly every single property in Ireland was surveyed and valued, from a small cottage valued at 2s. to large houses and extensive farms, making it the most comprehensive record of households in the country for the mid-19th century. Griffith’s Valuation recorded the head of the household, who was the person responsible for paying the tax on the property, the name of the immediate lessor (landlord) and the type, size and value of the property. What this means is that Griffith’s Valuation is a record of nearly every single household in the country, although only the name of the head of the household is recorded. Why is this important? Well, in the absence of the 1851 census, Griffith’s Valuation might be the only way to establish an address for your Irish ancestors. Let’s say you have found a marriage certificate for your ancestor in the 1870s or 1880s. The marriage certificate should record the name of your ancestor’s father, as well as his occupation. If your ancestor was born in the 1830s, 1840s or early 1850s in Ireland, we would expect to find his father in Griffith’s Valuation, if he was still alive. A search of Griffith’s Valuation for all households headed by men of that name will identify potential family addresses. It is important to bear in mind that you are searching for the head of the household in the 1850s. This may be your ancestor’s father, or even his grandfather. If your ancestor’s father was deceased, the property may have been headed by his widow or one of his older sons. Don’t search for someone who would have been a child in the 1850s, they will not be the recorded head of household. Griffith’s Valuation will identify the lot number of the property, the townland, the civil parish and the county in which the name appears. This will help you to establish the exact location of the family holding and the corresponding Roman Catholic parish in which your ancestor might have been baptised. Of course families with common names can be more difficult to find and you may have to focus your search on a specific county or even a specific parish. On John Grenham’s website www.johngrenham.com the name search uses Griffith’s Valuation to plot the appearance of surnames around the country. This function will give you an overview of where particular surnames appear in the Valuation, which can be broken down by county and then by parish. There is also a function to search for a second surname. This will illustrate where two surnames appear together in a particular parish. This can be helpful if you know the maiden name of your ancestor’s mother or his wife, as most people married within the population of their home parish. Griffith’s Valuation will also describe the type of holding that was valued. Most holdings consist of a house, offices (farm buildings) and land. If the ancestor who was head of household at the time of Griffith’s Valuation was a farmer, you are searching for someone leasing a house and land rather than just a house in an urban area. If your ancestor was a blacksmith, you are looking for someone who leased a forge or smithy. Some individuals leased more than one holding. They may have leased a house, offices and land as well as several plots of land. Your ancestor’s residence will be where a house is recorded. The only group that might be absent from Griffith’s Valuation are the inhabitants of tenement dwellings in large urban areas. In the case of these buildings the occupiers of rooms were not recorded, only the person who paid the tax on the property. Also absent in some cases are herds who were given a house on land where they were employed. While Griffith’s Valuation is not entirely comprehensive, it is the best record that we have of the population in the mid-19th century. If you don’t know where in Ireland your ancestors lived in mid-19th century Ireland, Griffith’s Valuation is the best source for establishing their townland and civil parish address. Griffith’s Valuation is available online at a number of different websites. It is freely available for research at http://www.askaboutireland.ie/... however, the search engine is not very flexible and usually requires a specific spelling of the surname. Griffith’s Valuation is also available at www.findmypast.iewith much broader surname variants. On both sites you can also search Griffith’s Valuation for a particular townland and the listed occupiers of that townland at the time of the valuation. John Grenham (Tithe Applotment Books) links each townland to Griffith’s Valuation on the www.askaboutireland.ie website, which is a quick and easy way to get to the townland you are interested in. Griffith’s Valuation also identifies the immediate lessor (landlord) of each property. In some cases the immediate lessor will be a ‘middleman’ who leased the property from someone else and then sublet it to tenants. In other cases the Valuation will identify the land owner. This can be a useful way to determine whether there are surviving estate papers, like rent rolls or leases, which might document an earlier generation of your ancestors in Ireland. If you find your ancestor on the estate of the Earl of Powerscourt in Wicklow or the Earls of Bantry in Cork and Kerry, there may be a great deal more records for these estates in the National Library of Ireland or the Boole Library in University College Cork. It is also possible to trace the occupancy of a property found in Griffith’s Valuation forward using the Valuation Office Revision Books. The Valuation Office Revision Books are updated versions of Griffith’s Valuation that record any changes to the occupancy, ownership, size and value of a property. The Valuation Office Revision Books are manuscript note books in which the original valuation has been transcribed. When the property was revisited and changes were notified, the changes were recorded in coloured ink, with the date recorded in the margin in the same colour ink. When the notebook was filled, a new notebook was started. Each notebook can cover a period of anything from 5 to 20 years. Using these books it is possible to trace the occupancy of a house forward from 1850 to the 1970s, when the valuation of residential properties ceased in Ireland. The Revision Books will demonstrate when a property passed from the original occupier to his widow or sons following his death. They will also demonstrate when a property was divided between two or three sons or if a property was transferred from the original occupier to his son-in-law. In some cases the emigration of a family is written in the margin, indicating the date by which they had left their property. The Valuation Office Revision Books for Northern Ireland are freely available for research on the website of the Public Records Office of Northern Ireland (https://www.nidirect.gov.uk/in...). Accompanying the Valuation Office Revision Books are the Union or Revision Maps, these are maps that show the boundaries of each land holding and were created in the 1880s and 1890s. These maps have been published on the www.askaboutireland.ie website with Griffith’s Valuation and are labelled as Griffith’s Maps. However, it should be noted that these colour maps actually date from the 1880s and do not always correspond with the lot numbers set out in Griffith’s Valuation. These maps should be used with the Valuation Office Revision Books from the 1880s and 1880s for an accurate record of who occupied each numbered lot of land. Another similar census substitute are the Tithe Applotment Books. The Tithe Applotment Books were compiled between 1823 and 1838 for the purpose of assessing the rate of the Tithe. The Tithe was a religious tax which was levied for the upkeep of the established Church, the Church of Ireland. Needless to say the Tithe was an unpopular tax and was abolished in 1838 after much civil unrest. The Tithe was only levied on certain types of agricultural land, which means that this was not a comprehensive survey, but it is the best national record of land holdings in Ireland from the early 19th century. If you locate your ancestor’s family in Griffith’s Valuation and have established their townland and civil parish address, you can now search for an earlier generation of the same family leasing agricultural land in the same townland in the 1820s and 1830s. This may identify the father of the person you found in Griffith’s Valuation. The Tithe Applotment Books have been digitised and freely published online at http://titheapplotmentbooks.na... but before you go rushing off to check this collection there are some serious problems with this publication that should be taken into consideration. Numerous errors in the spelling of surname, first names and placenames were made when this collection was transcribed. Searching for your ancestors under their surname may be fruitless, if their name has been incorrectly transcribed. Equally, townlands and parishes have been indexed in the wrong counties. This makes the search function of this site unreliable. However, it is possible to use the site to browse copies of the Tithe Applotment Books. If you know the parish and townland in which your ancestors were living you can click through to the relevant, county, parish and then townland and inspect the original pages for that area and determine for yourself whether there are any relevant entries. If you do need to use the search engine, try using wild cards. Rather than searching for Loughlin, search for L*l*n to see what turns up, you can always narrow your search, depending on the volume of results. The Tithe Applotment Books for most of Northern Ireland have been indexed online at www.rootsireland.ie which is a subscription website. The index only records the name of the head of the house and the townland address and year of the book. The details of the land holding are not included. The Tithe Applotment Books were compiled prior to the first Ordnance Survey of Ireland. The Ordnance Survey of Ireland standardised the spelling of Irish placenames. Prior to the survey sources like the Tithe Applotment Books would have used variant spellings of townland names. The books also included sub divisions of townlands, which were dispensed with by the Ordnance Survey. This means that the Tithe Applotment Books can often be the only record of a locally used placename. If you find a placename on a civil certificate or in a parish register, that you cannot find in the Index of Townlands or in Griffith’s Valuation, it is worth checking the list of townland names for a specific parish in the Tithe Applotment Books, where you may find a reference to the local name. 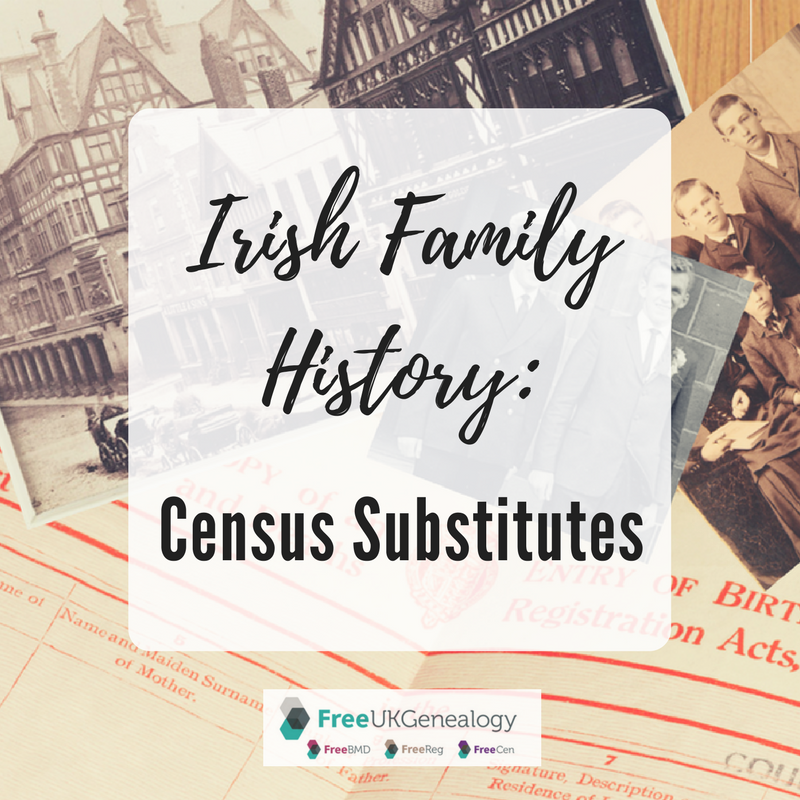 Although Griffith’s Valuation and the Tithe Applotment Books only record the names of the head of the household, they are the only surviving national census substitutes and are a very important resource for establishing a family address in the first half of the 19th century. A family address can lead to parish registers, estate records and other local census substitutes that might document your family further.